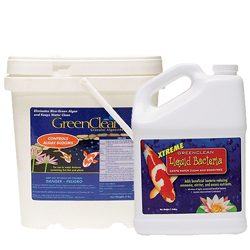 Home / Product Types / Algae Control / Dry and Tablets / Biosafe GreenClean Team / C16004 - GreenClean Team, Algaecide 8 lb + Xtreme 1 gal. GreenClean Team, Algaecide 8 lb + Xtreme 1 gal. 17 and 32 oz bottles with no mess measuring spout.